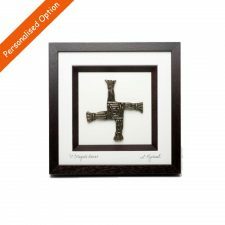 A lovely St. Brigid’s Cross as wonderful framed bronze art, signed by the artist. St. Brigid’s Day is February 1st. St. Brigid is the second patron saint of Ireland, famed for her love and generosity to the poor. 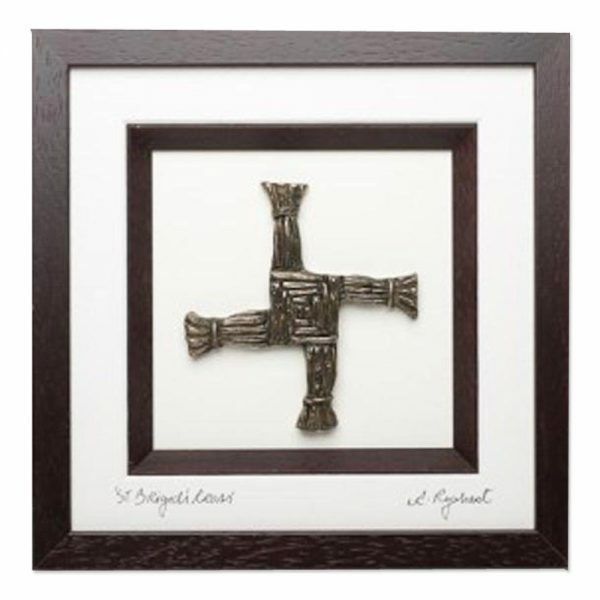 The St. Brigid’s Cross, as legend would have it, came to be when Brigid sat with a dying pagan chieftain, she began to weave rushes into a cross. Brigid used this cross to explain Jesus to the pagan chieftan, who then asked to be converted and he was baptised just before he died. 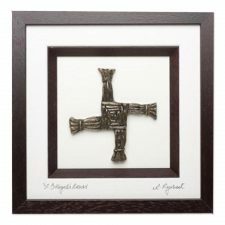 Traditionally the St. Brigid’s Cross is hung in homes to protect from fire and evil. See my blog on St. Brigid and the St. Brigid’s Cross. Dimensions: In a black frame, approx. 210mm x 210mm. Handcrafted in Co. Cork, a wonderful Irish gift. Created by Rynhart Fine Art Bronze, based in beautiful Glengarriff, Co. Cork. 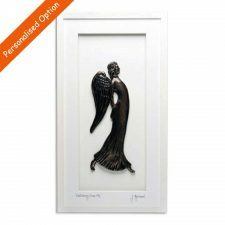 Jeanne Rynhart formed this company in 1981 and is well known for famous public sculptures such as Molly Malone, Annie Moore and the Rose of Tralee. In 1994 Jeanne’s daughter, Audrey, teamed up with her. 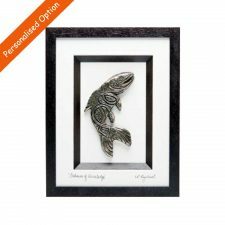 Audrey and her husband, Les Elliott, now run the business from their studio in Glengarriff where their passon for Irish history and Celtic design is evident from their attention to detail in Rynhart bronze art pieces. Brigid is the confirmation name my parents chose for my sister, Bonnie Kathleen. Being raised with an extremely large and exceedingly Irish family of Kelly’s from Lismore, our heritage as well as our names have always been a source of great pride. All of my sister’s Christmas gifts this year are Irish in nature. 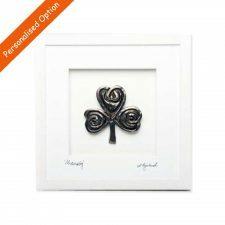 A canvas print of The Dark Hedges, a metal art piece with my Mother’s favorite blessing, “May the road rise up to meet you”…….but the best and most personal gift is the beautiful St. Brigid’s Cross. It is approximately 10″x10”, simply matted & beautifully framed. Dealing with Totally Irish Gifts and their wonderful customer service was professional, easy and thoughtful. 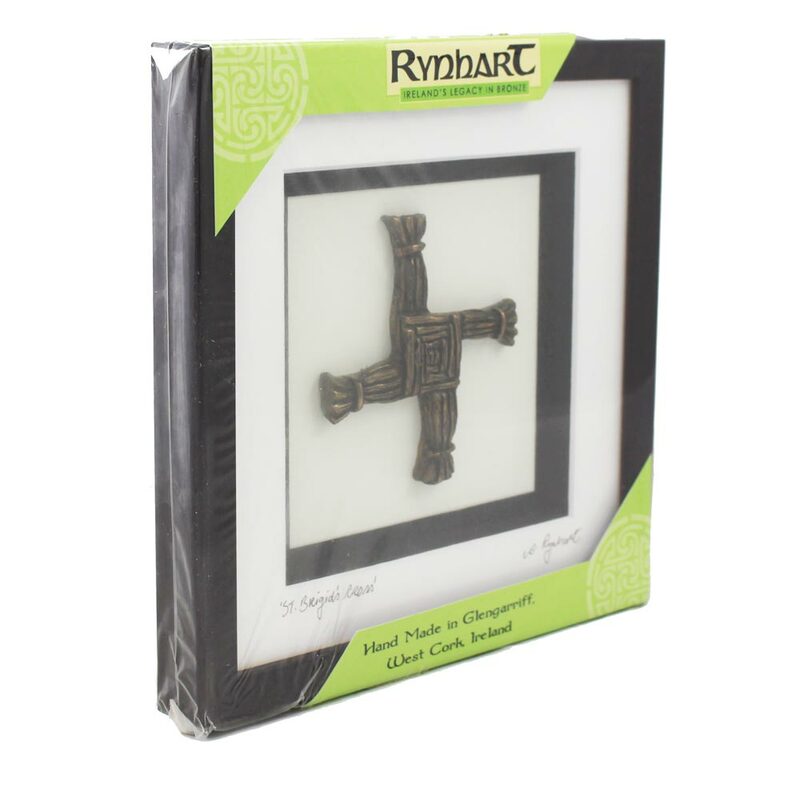 There was no problem with currency exchange, my package arrived sooner than expected, and I am so excited for my sister to open her very own, made in Ireland St. Brigid’s Cross. I couldn’t be happier. Received this beautiful piece today it is even nicer than I imagined. I had it personalised for a special lady. From beginning to end I can’t compliment Totally Irish Gifts any further, they went above and beyond the call to ensure that I had this piece on time. Hi Shauna, I bought the St. Brigid’s Cross in a black frame for my husband’s birthday and he loved it. Thank you for your prompt reply and for the continuous excellent customer service each time I deal with you guys.